We pick you up outside your accommodation in Alice Springs at 5.45am and drive through the beautiful outback. Our first stop will be an outback roadhouse for a quick breakfast (at your own expense), then back on the road and a short stop at an authentic camel farm. 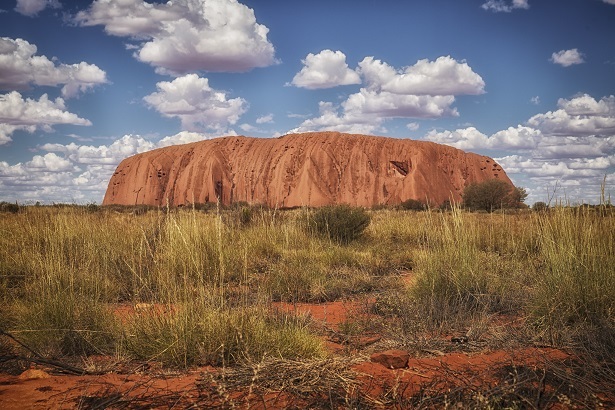 If your starting the tour in Uluru, we will pick you up from the Outback Pioneer Lodge at Ayers Rock Resort at 1:15pm (Oct-Mar) / 1:30pm (Apr-Sep), or from the Ayers Rock Airport at 1pm (Oct-Mar) / 2pm (Apr-Sep). You will continue on to the permanent campsite at Yulara for lunch (Oct-Mar only) before embarking to explore the 36 domes of Kata Tjuta. Here, we get up close to this ancient geological formation during an afternoon hike. The perfect end to a remarkable day is watching the Rock’s rich colours change against a blazing Red Centre sunset. After sunset we drive to our campsite for hot showers and a hearty meal. Depending on your mood you can choose to sleep in a permanent 4 share safari tent (bunk beds) or in a swag (Aussie bedroll) under millions of outback stars. NB: Optional upgrade to twin tents available at $40/person per tour which includes sleeping bag & pillow. Inclusions: Camping Accommodation, Coach Pick Up, National Park Pass, Lunch (Oct-Mar), Kata Tjuta Valley of the Winds, Uluru Sunset, Dinner. Up early for breakfast before enjoying a glorious sunrise with a walk around the base of Uluru. Deepen your understanding of the land and the Mala people during a walk with your tour guide. After lunch we will drop you off to the Outback Pioneer at Ayers Rock Resort by about 12.15pm or to the Airport around 12.30pm. 1 Night Campsite Accommodation - 4 person Safari Tent (bunks) or sleep in your swag under the stars. (NB: Twin Share Accommodation available (additional $40/person per tour). Campsite facilities include toilets & hot showers. Bring your own sleeping bag and travel pillow. (Sleeping bag hire $20 per person). Enjoy the early morning stillness as the colours of this magnificent rock come to life as you walk the base of the rock. 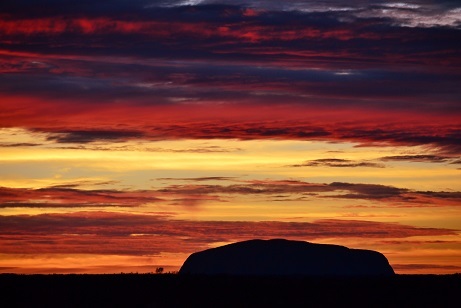 Enjoy the colours of Uluru change as the sun sets. Guided 5.5km walk through the Valley of the Winds at magnificent Kata Tjuta. Package includes a 3 Day park entry pass for 2 Adults valued at $25 per adult & $12.50 per child. If you have any questions or would like to discuss any changes , email info@uluru.com or call us on 1300 559 390 (within Australia). +61 1300 559 390 (anywhere from Overseas). You may also refer to our Frequently Asked Questions. I'm Interested in booking this package! Can I book with a travel agent?